Designs in the furniture category had to be produced using two sheets of flat materials, one rigid and one flexible, no larger than 5 feet by 10 feet. Any material that would be available for sourcing by Flatcut was considered valid. The winning design, RECIP, is a modular furniture system by three students at the University of Calgary’s Faculty of Environmental Design. 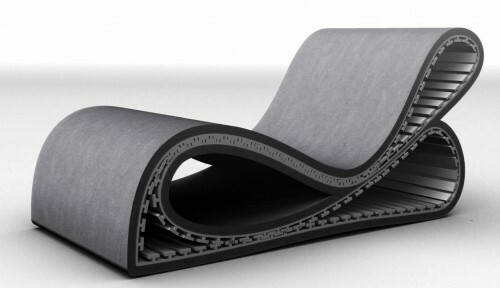 The project explores scoring techniques applied to 1/8-inch-thick recycled rubber, which is then folded into self-reinforcing and interlocking toothed panels and laminated to heavyweight felt batting. The team showed judges how the rigid yet flexible system could be folded into chairs, tables, shelving, or spatial dividers, then dismantled and recycled at the end of its life. “I think what attracted us [to RECIP] innately in a contemporary way is the fusion of two different materials and the way they performed together,” said competition judge Tom Wiscombe in his comments. “It involved certain types of techniques, like fusing, melting and different modes of manufacturing rather than using a single known tooling process.” Click here to see a PDF of the project boards. Partition category designs were permitted to use three 5-by-10-foot sheets of material to build their designs. 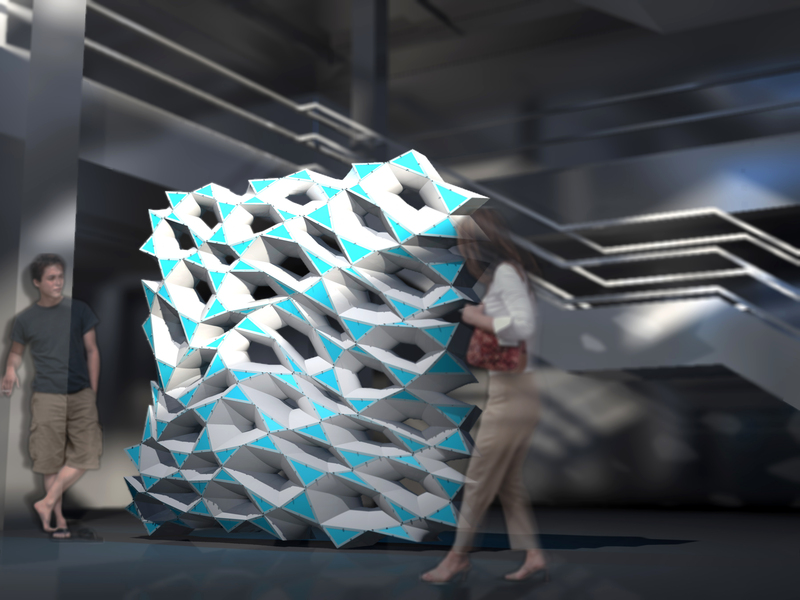 The winner, Hyperlaxity: Parabolic Ligaments, was a collaboration between SOM’s Elizabeth Boone and PROJECTiONE design and fabrication studio founded by Adam Buente and Kyle Perry in 2010. The design uses aluminum components, including hundreds of v-clips, o-rings, i-bars, and triangular plates, joined by hexagonal silicone tendons with slits that allow the material to stretch over the aluminum pieces. Judge Dror Benshetrit said the non-modular form pushed parametric design. “I like how technically the inner rings, together with the other shapes create different opposite hexagon forms,” he said. Click here to see a PDF of the project boards. Like the furniture category, designs in the lighting category had to be produced using two sheets of rigid and flexible materials within the machine-able dimensions. 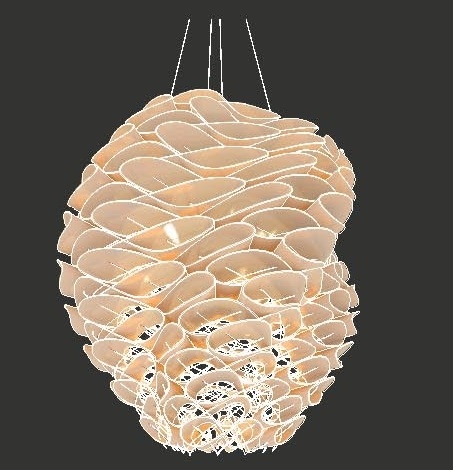 Inspired in part by the fanciful linen collars of 17th-century Europe, the winning design is made with folded and nested ruffles of laser-cut 3form Ecoresin held together with a lattice of aircraft suspension cable, which produces tensile and compressive forces to create the light’s structural stability. 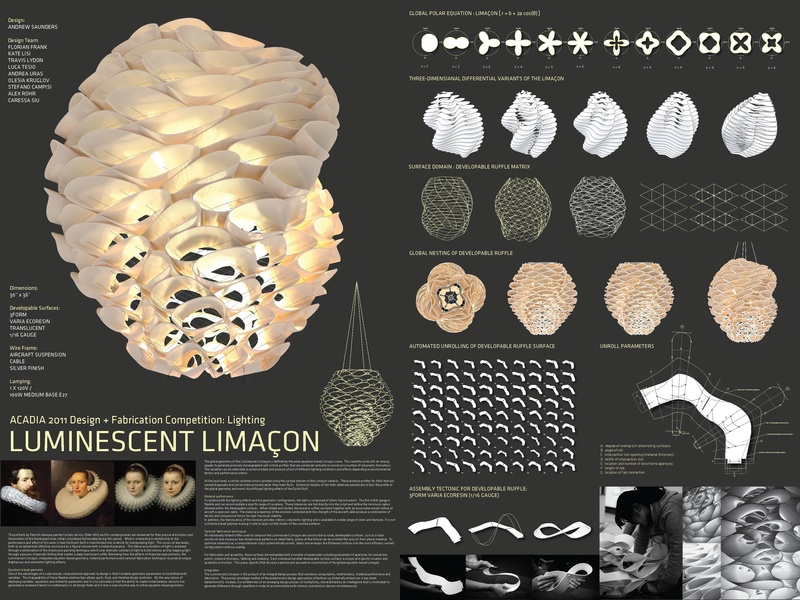 Designer Andrew Saunders, an assistant professor of architecture Rensselaer Polytechnic Institute in New York, derived the pendant’s shape from a Limacon curve. The variables of this equation can be changed to produce different lighting effects based on conditions and performance criteria. “That it is two systems, one of a surface system and one of a kind of vector, is what I think together makes it look so beautiful and elegant,” commented Wiscombe. Click here to see the project boards.